Referral programs, point systems, gift cards and membership deals can optimize your existing customer base and attract new customers. Don’t have enough time or employees to spare to get any of these projects off the ground? Don’t worry. Loyalty software that links directly to your credit card processing terminal, whether it’s in store or online, automates the whole process. The influx of new customers will pay off—and exceed—the cost of integrating loyalty software. High-volume offer redemption is the key to profitable loyalty programs, so software designed to facilitate just that, and show real results, is a solid option over manual program management. While social media doesn’t guarantee a spike in sales, it’s a good way to draw attention to your brand and display your team’s personality. Depending on your products, services, and target audience, you can determine which social media platforms will help your business impact more people. For example, if your products are highly visual, Pinterest and Instagram would be smart options to leverage. Facebook and Twitter are always great for updates or special promotions. If you offer services to professionals, LinkedIn would be a practical addition to your marketing agenda. You can easily find demographic information for each social media platform. For example, according to Sprout Social, 45% of internet using women use Pinterest, while only 17% of internet using men do. Facebook sees the majority of action from women as well, at 83%, compared to men at 75%. It’s the most popular social site, and also the most popular for older adults (72% of internet users ages 50-65 use Facebook, while 62% of those 65 and older use Facebook—a higher percentage than all the other social media sites). Twitter has an almost equal amount of men and women users, while LinkedIn is the only site that sees more men users (31%), compared to women (27%), and the majority of users have at least a bachelor’s degree. While these are just a few examples, you can drill down to specific age groups, salaries, areas, and more. So if you have questions about where to promote your material online, you can take a look at where your target audience is showing up the most. With a quick post, you can promote products and services and let customers know what’s new. Through an API, you can even incorporate features from other websites, like a Facebook “Share” button right on your blog so viewers can share your material with one click. Or, just post a picture of the office cat wearing a tie behind the checkout stand to get a few laughs and increase your visibility without coming off as having a not-so-hidden sales-pushing agenda. People appreciate humor and the absence of financial motive when it comes to social media. Learn about growing neighborhoods in your city or county and consider relocating or adding another branch of your business to a spot that’s booming. Identify your target market and bring the products to the customers. A great option would be opening a pop-up shop that can go to different community events and trade shows. A pop-up shop, sometimes known as flash retailing, is a temporary version of your store, online or retail, that can move around to different areas, fostering fresh, unique engagement with customers. Pop-up shops are an affordable way to test new areas, increase brand awareness, and create a sense of urgency in shoppers, who may be more willing to buy something if you have a limited time offer during your short-term appearance. Wireless terminals and mobile payment applications that can run on your smartphone or tablet would come in “handy.” Learn more. Take advantage of every demographic by offering flexible payment methods. Most payment solutions come with automated invoicing features, so you can send customer invoices with an easy “click to pay” button. Say you own a landscaping company and only accept cash or paper checks in the mail. When you email an invoice at the time of your service, customers are more likely to pay you on time with their credit cards, and you’ll have the funds for that job way faster than you would if you had to wait for a check, bring it to the bank, and wait for it to (hopefully) clear. If you already accept credit and debit cards, adding an electronic check option gives you access to more customers who prefer paying directly from their bank account. Depending on what kinds of products or services you sell, you could start accepting healthcare payment cards or EBT. The ability to accept all forms of payment over the phone, online and in person will give your customers the convenience they’re looking for. If you look at the sales reports generated by your POS system and numbers are dropping, try something like adding new team members working off commission only. It’ll create more competition among existing employees and motivate them to take more interest in what they’re doing. Being adaptable and paying attention to employees’ performance, and using positive reinforcement like bonuses or recognition to reward the exemplary ones, help keep your team on the same page about what your goals are. Passionate employees incite passion in customers. Use your credit card processing records to look at customer spending habits, then capitalize on the most popular products and personalize your advertising methods. Survey them. Listen to their responses. Make changes as needed. The odd bad review happens, but it can actually lead to a “service recovery paradox,” when you make up for a negative experience with a very positive correction and end up with an even stronger relationship with that customer than before. For example, if you manage a restaurant and see a bad review from a customer who had a terrible dining experience, you can address the problem with all of the employees and get to the bottom of the disconnect in your restaurant’s mission and how things are actually running. You can reach out to the unsatisfied customer, offer a gift card so he can try out your place again, and make up for the poor experience with an excellent one. That customer may become a regular after the correction. Responsiveness goes a long way. Ensure your customer service team is readily available on the phone and give customers personal attention to let them know how much you value them. While it may seem counterintuitive to mingle with the competition, you could come up with a mutually beneficial advertising partnership, like offering a restricted open-loop gift card that only works at your stores. If your new frenemies decide to close, you never know what doors the relationship could open down the road. For example, you might end up with an investment opportunity or new clientele when someone retires. Building partnerships and referral networks is a good way to get your business more exposure and footholds in the community. For example, if you’re spending a lot of time counting inventory by hand, look into a new POS system that tracks inventory for you. See how your POS system can link with QuickBooks to make accounting easier. Instead of guessing and taking chances, you can look to online reports generated by your POS system to guide smart business decisions. For customers making monthly payments, automated recurring billing plans are low-maintenance ways to stay on top of those payments. If you have an ecommerce site and retail location, your payment gateway and POS can integrate to give you a comprehensive view of your sales data. 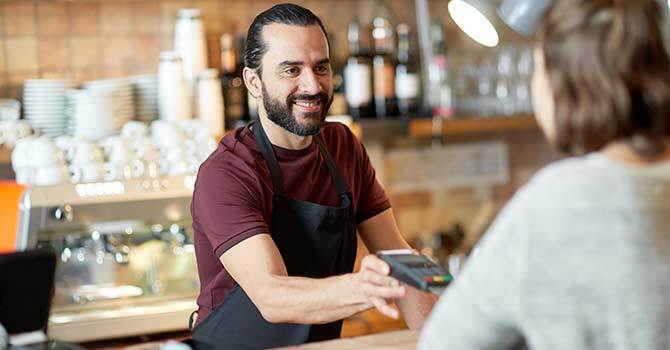 Use your employees for face-to-face customer service rather than tasks that can be done by POS technology and your merchant account provider. Being small is definitely a cool factor today. Accentuate your grassroots charm and get the “shop local” crowd on board. Mom-and-pop stores have a growing appeal in an increasingly corporate economy. Use your POS system to recognize repeat customers, create accounts for them and offer rewards. For example, your loyalty software could alert you when it’s a customer’s birthday, and you could give them a special discount or free item. You can never go wrong adding a personal touch to customer service, and this option is most viable for SMBs. Make sure your advertising matches your products and provide customers with in-depth return policies in plain language. It’s also a good idea to make sure your business name matches your billing name so that customers recognize it on their card statements. Not only will it improve customer satisfaction, it will lower the risk of returns and, worse, chargebacks. Quality products with appropriate advertising can help you manage customer expectations and give your brand a reputation of honesty and transparency. One common problem area is coupon advertising with vague or fine-print caveats. The customer may not see that the coupon can only be used online, not in store, or has a very limited time to be redeemed. Be straightforward and simple with advertising and liberal allowing customers to redeem your offers so that they’re not confused and disgruntled when they realize the difference between their perception of your advertising and what it’s actually saying. All in all, delivering quality products and services to your target audience is the base ingredient of any successful sales recipe, but from there the options are endless to enhance your relationships with customers and give your sales potential a push in the right direction. Find what sets your business apart and make it your greatest asset. Take risks; people are attracted to what’s different, and notice things that stand out. And, best of all, your payment solution can do most of the heavy lifting so that you can prioritize your new initiatives. BankCard USA Merchant Services is a registered ISO/MSP of Wells Fargo Bank, N.A., Concord, CA and Westamerica Bank, Santa Rosa, CA. American Express may require separate approval | Copyright ©1993-2018 BankCard USA. All Rights Reserved. A BankCard USA consultant will be in touch soon to discuss the ways we can support your business. BankCard USA will never share or sell your information.